This is an awesome app. It actually has the potential to bringing back the “golden era” of CartoonNetwork. This was the era when the Hanna-Barbera cartoon shorts from the late 50s and 60s were broadcasted on CartoonNetwork. These shows were Quick Draw McGraw, Secret Squirrel, Pixie Dixie and Mr. Jinks, Ricochet Rabbit and Droopalong, and several more. Boomerang HAS to include these cartoon shorts. There are many new cartoons on this app that I am not as interested in from this modern era. However there are other cartoon shorts from the 90s that should definitely be on this app, such as 2 Stupid Dogs, and a few from that era. This is a four star rating, but could easily become a five since this app has so much potential. I saw the boomerang ad on snapchat, and i would love to download this but the thing is payment. Why can’t this be free. It’s like we’re paying to watch our childhood. I feel like more people would download this app if it was all free. When i was growing up i loved The Flintstones , Scooby Doo , and other TV shows. But i can’t enjoy it if i have to pay. Please let this app be free. Like if you agree! I Remember Watching Boomerang Went It Was Amazing.Great Cartoons,Great Movies,Great Promos,Great Bumpers,And Great Songs And Shorts.And I Was Sad When The Company Rebranded It But Thanks To This App,I Love Boomerang Even More.I Do Have Three Complaints Though.Number 1.I Know This App Just Started Last Year,But Put More Obscure Classic Shows On Here.Pixie And Dixie, Penelope Pitstop, Swat Kats, MGM Cartoons, Banana Splits,Ruff And Reddy And Hey Even Some Classic Action Shows For More Variety. Number 2.Put Up Different Movies.I've Notice The Biggest Franchises On Boomerang Are Scooby Doo, Looney Tunes,And Tom And Jerry.And Those Are The Most Movies Up On The List.You Gotta Have Variety In Your Movies,Put Some More Looney Tunes Movies,And Some 1960s,1990s,And 2000s Movies As Well. Well This Review Got WAY Too Long,I Just Wanted To Thank You For This App,Thanks For Bringing Back My Childhood,And Thank You For Hearing Me Out.I Do Have Two Big Requests Though.The Pink Panther And 2 Stupid Dogs.I Can't Wait To See What This App Has Later On. Amazing Nostalgia. It makes u pay for mostly everything I went on to the free episodes section and there was only about 6 free episodes like come on please change that!!!!!! U could just make us sign into our tv provider things like no one is about to pay for shows that never come on tv!!!! Works ok on iPad and iPhone but the Apple TV version randomly loses its sound. It’s not my sound system I’ve checked. It’s the only Apple TV app I have that loses its sound. The video still plays but with no audio and it happens at random. Sometimes right away and sometimes an hour or 2 into watching something. Once you hit the go back button and click and resume whatever you were watching it will start audio again for a while. Easily a 5 Star App and service if it wasn’t for this. Please fix. :) I’m using a 4th gen Apple TV (non 4K version) running the latest version of tvOS. This is so stupid!!! Why would you make us pay for stupid cartoons that no longer airs on TV?!???? Why are we not permitted to log in through our service provider?? Would love to be able to use but alas I will not be signing up for any more subscriptions. I downloaded the app with the hope of starting the 7-day free trial. I was able to create an account and watch very limited free videos, but I cannot start the free trial and/or subscribe. I click the subscribe link, choose the annual option, and it asks for my age, then nothing. They sent me an email reminder to start my free trial, but clicking on the link opens the app and takes me through the same script which doesn’t work. I tried deleting the app and clicking the link in the email and that doesn’t work. I’ve tried downloading the app again, and that doesn’t help. I’ve contacted their support but haven’t heard back yet. However, I am not holding that against them since it is Saturday and has been less than 24 hours. I will update the review if/when the issue is resolved. Great app just wish I could use it on my PS4 as well. Baby Looney Tunes Volume 7 Episode 12 “Save Our Cinnamon” is messed up. Around 3 minutes 36 seconds the picture is jumbled and the audio is static. This lasts until around 4 minutes 10 seconds. Please look into this issue. 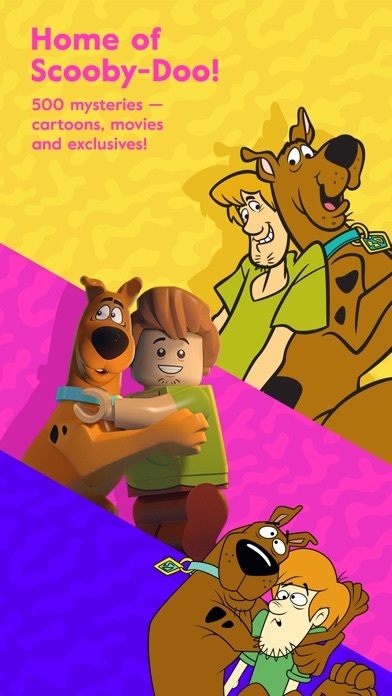 I’m all exited to watch this show and all of a sodden the freaking thing said that I have to buy it listen I have tv but no boomerang I use to and I loved and I mean loved scooby doo then it was gone now I have no way to watch my only favorite show in the world. So can u guys at least make it have to have a tv whatever instead of making us pay money in real life.... 😡 pls update it or something to make it better so we don’t need to pay money. Good luck getting thirty seconds into an episode without buffering. Good luck watching another thirty seconds without buffering. It’s not my internet. Everything else works fine. Frustrating when my kids really want to watch this episode of Baby Looney Toons. Where are the 2,500+ ? I don’t remember if the App Store said 2500 shows or episodes...Wikipedia says Mega Man was added August 12 and it’s not on the app—where are all the shows??? Or update lists? I was so excited to watch Bugs Bunny and Tom and Jerry with my daughter instead of the stuff they have on tv now. The app to TV worked great for a day or two and I was getting ready to get the yearly subscription when all the sudden I could not cast from my iPhone to the chromcast anymore. I’d been able to just fine then all the sudden it just stopped. I contacted the help center and they asked if my iPhone was up to date I told them it was and no reply. Well I responded the next day and no response at all. So sadly I canceled my service after the 7 day trial. It makes me sad be because I really enjoyed all the cartoons they had on but wasn’t going to pay for something that wouldn’t work. They lost a customer. Works great on my phone but the second I try to use chrome cast it cuts out and gets stuck buffering. It won’t go more than 30 seconds without crashing, which is pretty frustrating to say the least. I enjoy being able to share the shows I used to love with my son but when this is the only app that has constant issues with casting it makes me not want to subscribe. The sound is not working with the app!! This app claims to have ALL of my favorites, referring to my favorite cartoons, but this is a lie. This app only has SOME of my favorite cartoons. Without shows like Johnny Bravo and Dexter’s Laboratory this this app can not be claiming to have all of my favorite cartoons. I would not be happy spending $40 a year to watch only SOME of my favorite cartoons. I love this app, but there’s one thing that I have a problem with. I’m unable to download videos on my iPhone se. I went to the support page and everything checks out, but when it starts downloading a cartoon it doesn’t actually download. Instead it just says it’s loading forever. Once they fix this issue this will be a 5 star app. Very good app. Nowadays you can’t see this on tv. I recommend my kids to watch those cartoon not bad content. I can’t cast any of the shows anymore after updating the app. This is my second time writing in and still fixes were made. It’s great to have all your childhood shows but what’s the point if the app doesn’t work to your liking. Renewal Fees - No Refund! I find it hard to believe that the auto renewal happens and even though you notice it 10 days after it happens the subscription page tells you there is no refund options available. I now have direct tv and all of our favorite shows like Dexter’s Lab are already being recorded on my DVR. I don’t think we’ve used this app in probably a year but there are no options available. With the tech out there it just seems like this is a rip-off. Very disappointed. So glad my daughter can experience my childhood cartoons so easily with this app! Plus it’s only $40/year!! Love it! 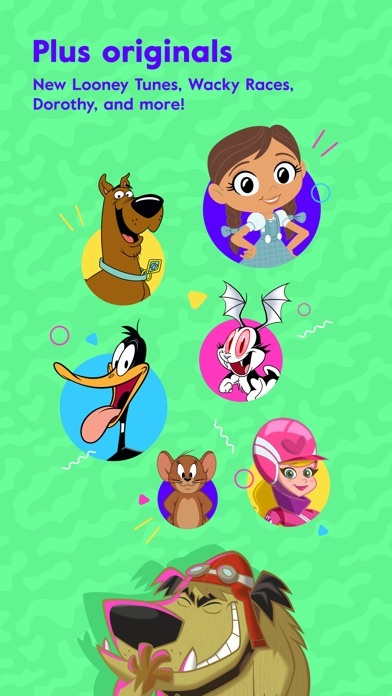 I was very happy to see that there was a Boomerang App, because I love the older cartoons like Scooby-Doo and The Flintstones. I wasn’t happy to see that there was a subscription to watch it. This is because I had Boomerang added to my channel lineup a while back in order to see the older cartoons. I would love to be able to watch this app, but don’t feel that I should have to pay for the same thing twice. If the app was free for those that already have it in their channel lineup that would be great or at least a lower subscription rate. This is a great app. I get to share cartoons that I grew up watching with my kids and it’s nice to have a couple of things downloaded on hand for when I’m waiting in line or bored on the train. One thing that bugs me about this app is that the download function doesn’t always work. Sometimes I’ll repeatedly tap download and nothing will happen. Other times downloads will take forever or sometimes the download appeared to be fixed finished only for me to find that it didn’t finish downloading once I get somewhere and want to watch something. I also find downloading movies to be nearly impossible and I haven’t successfully done so yet, which is so disappointing! If those issues could be fixed, this would be perfect and I would most likely renew my subscription, which I’m currently thinking of not doing. I like the list of shows but where is thunder cats, aquaman , the hulk Spider-Man he man smorks all the classic superhero show(with an exception for smorks)? Will these ever make it on here? This app is not very accessible with the use of Voiceover on all iOS devices! This problem needs to be addressed, as I love all the cartoons that are on here, but I’m blind, and I wish to enjoy this app as well as my sighted counterparts. And this still has not even been fixed. I subscribe to Boomerang through Itunes and the current version does not allow me to restore my present subscription. When I try it tells me that restoring subscription is only for those who subscribe through Itunes which I have. This results in me not being able to watch many of the episodes. Please fix this because otherwise it is not worth paying for. I LOVED Boomerang as a small child, it was the only channel my sister and I agreed on. I’m so happy to see I can watch a lot of the same old shows now. There are definitely a few shows missing though that I’d love to see added. The Snorks was one of my favorites and I would really like to be able to watch it on Boomerang again. I tried to watch Courage the cowardly dog on it Would not let me reason why is because I have to do the membership and can’t do the membership. I would love to see you guys, both on this app and the regular Cartoon Network app to adopt the model that crunchy roll has. Have all of the the shows free to watch, but place a bunch of ads during each episode like regular tv. If you don’t want the ads, plus some extra exclusives, then add a subscription service. Your audience is primarily people 20 and under, and most kids don’t have a way of paying for a subscription service. If this was Netflix, it would be a different story. You’re not Netflix. I want to love this app, but I can’t. Your free episodes are extremely limited (literally 7 episodes of different shows), and it’s inconvenient to a large portion of your audience. This app is really nice if you’re planning on watching everything on Wi-Fi but if you plan on downloading any movie or episode, good luck! Because the downloads don’t ever download or they show up in the downloads but don’t even show that it’s trying to download. I really like this app but if I’m going to be paying for this it needs to be improved. I’m really disappointed. I downloaded this app ages ago. Still has the same issue. I try to sign up and it says consumer not loaded! How do I watch or fix this?? Take some time to review my review? Not very interested in the amount of free cartoons maybe try and offer the better episodes instead of the less popular ones and 40 dollars a year that’s a little more than I would want considering I am only going to be using this app periodically it’s more of a money montage of your so called team putting some of cartoon networks older shows together I don’t understand why all of cartoon networks shows are not on here isn’t that what people are supposedly paying for? If your team figures out a way to lower the price of the membership then maybe I’ll considering letting you steal my money until then I wish you the best of luck and this review was just helpful criticism nothing against you. I wish I could link this up with my account with cable, because all the shows I want to watch are on the app. Why did you take the classic cartoons off? I watching adult swim and I saw an ad for the app saying it was free and I downloaded it to watch my favorite old cartoons and found out you have to pay for a subscription. You guys should make the app have to be paid for then. Either that or make some episodes free and some paid for... I didn't download the app just to look at pictures. I love courage the cowardly dog but I can’t watch it because I can’t pay with iTunes and that’s all I have 🙃 But other than that I’m sure it’s a great app.. I was ecstatic to find out about this app! Since their channel on TV is starting to show newer shows, I thought that was the end of Scooby Doo and other old favorites. That’s when this app gave me hope! It’s a great price to subscribe, and it even has movies from some of your favorite old series! It’d be cool to have slightly more content, like 3-5 more shows. Only issue I have is with playing it on chrome cast or my laptop. When casting it, I can’t rewind or fast forward and when watching on my laptop, I don’t always get sound. That, or the sound will continue, while the picture is frozen. It’s weird. Aside from those little bugs, and being eager for slightly more content (I mainly just want some more of the prominent Scooby Doo movies LOL) it’s a great app that any fan of the channel should download. I love the older classic cartoons, but many of us want more than what is currently available. When I downloaded this app i kind of expected to have access too ALL cartoons that aired on boomerang, like Johnny Bravo for example. Johnny Quest, Looney toons and Scooby Doo are great, but most people nowadays want the 90’s cartoons that they grew up with, as well as the older, classic cartoons the 90’s kids’ parents grew up with. Like it says on the title, good idea, needs more content. Has not worked independently on Apple TV for about a week. It just spins and then finally a little red error circle shows up in the lower left hand corner of the screen. Works fine on my iPad when I stream to the Apple TV. Pleas fix the app on the Apple TV. I paid this app for about 3 months but since I watched most of what I liked I decided to take a break. I came back today to re-subscribe, which I did and paid the 4.99 through iTunes. However, now when I log in, it says I need to subscribe again even though the app itself tells me I am susbcribed. Can’t watch anything even with being subscribed. Money got taken right away but the service isn’t being provided, I feel robbed. Won’t see me come back to this app, hope that 4.99 lasts you for a long time because you just lost a customer. I wanted to subscribe but after trying to watch the free Bugs Bunny show, there would be no sound, only video coming from my TV. I’m playing the app on my phone, and (through wifi) streaming it on my Apple TV. My Apple Tv apparently doesn't have an App Store. So I have no choice but to stream it from my iphone to the TV. The strange thing is that if I switch to Spanish, the sound works fine! But in English, no dice. Hopefully they can fix this? Updates will not let me view the app anymore. I pay so what the heck. I don’t like how when you choose a category say looney tunes and it just plays a random episode. I would like to see all the episodes and choose myself please. With TV providers it is sooooooooo much easier to get episodes free. You just have to agree with the tv source you have.EDIT:WHY DO WE HAVE TO PAY!!!!!!!!!! Update: I have had the app for a few months, and I originally gave it 4 stars. I am now giving it one star. As an app that I pay for (almost as much as I pay for my student Amazon Prime! ), I expected to see new shows added on a regular basis. This has not been even remotely happening. I expected to eventually see some older cartoons added (ie. The Snorks, The Powerpuff Girls, Hong Kong Phooey, Dastardly and Muttley, Josie and the Pussycats, Speed Buggy, Pink Panther, etc.). Nothing but a few of their “new” episodes from their new shows have been added. It’s irritating and I won’t be renewing unless something changes. I LOVED Boomerang as a small child, it was the only channel my sister and I agreed on. I’m so happy to see I can watch a lot of the same old shows now. There are definitely a few shows missing though that I’d love to see added. The Snorks was one of my favorites and I would really like to be able to watch it on Boomerang again. I love the app in theory, all my favorite shows when I was a kid. But I’m always disappointed as I haven’t been able to get through a single episode. Every video stops playing seconds in. I’ve tried buffering and closing the app and reopening it. This is my second time downloading it hoping the app would be better by now but still doesn’t work at all. This app keeps crashing and won’t allow me to stream to my tv with this latest update. I subscribed to the annual boomerang membership and I tried to click on courage the cowardly dog and it told me “the operation could not be completed, please upgrade your subscription to access this video” if this gets resolved I will give it 5 stars. Love the access to old favorite cartoons. Always new content being added. Well worth the year subscription fees! I am unable to download videos because it takes way too long to process. Then when I try again later the download icon freezes when I tap it. I can’t even delete the attempted downloads to start over again. Please fix? Why should I have to pay for something when I already have it. This app will make u pay money but I have this channel on the tv. You should connect it to the tv so we don’t have to pay more money then what we do pay. Make it more like the Disney now app. I had such high hopes for this app that were ruined. It’s a great app ruined bc u would rather make money than make other people who already pay for this happy. Great job! You ruined some of my most favorite childhood memories. Up until very, very recently, this app was described as completely free when it's not. The newest method is to pay a monthly subscription fee just for this app when everywhere else it's actually free. You can't hook up your satellite, cable, or any type of account to it if you already have it. Only 7 "free" episodes actually exist compared to the whole series of shows. You're literally better off just buying the box sets or the free eps on YouTube without even downloading this. This app is amazing! I have only one problem. I wish you got more episodes for the free version maybe just a couple? Anyways I just downloaded this app today and I am amazed at it! Most apps make their game look fun in the advertisements but really they are trash! And that’s the reason why I like this app! Whenever I download something like this it always would crash and my iPad would freeze which was really annoying! 🙄🙄 If someone asked me if this app was any good I would say: Of course! It is amazing! Another reason why I like this app is that it has all my favorite cartoons! I can’t say anything bad! Thank you for making this app! (This is a great app but it’s needs more shows could you please put ed edd n eddy on the app I’d really appreciate it. Update to respond to response: Thank you for responding, but that is a silly policy. Don’t you guys read the papers? That’s not how successful content platforms work. Binging is king. Call me when you guys figure this out. Previous review: I’m not paying $40 a year for partial collections. Only a handful of episodes for each show? The fact that CN/Boomerang own the rights to all classic cartoons and is holding them hostage behind a paywall is SHAMEFUL. FXNOW has EVERY SIMPSONS EVER easily accessible and free. A short commercial ad and you can see anything you want. If you adopted that strategy you’d make $40 a day on me with Bugs Bunny rabbit holes (pun intended). As is, this app/system is VERY disappointing. I first tried this app a few months ago and did the free trial. It was working fine. I paid for it and it doesn’t even play videos on my chromecast. It’ll play for like 2 seconds then it’ll just freeze. It’s not my WiFi connection because I don’t have problems with any other streaming apps and my WiFi is strong. It’s annoying paying for something when the app won’t even let you use it. It is good to see Old School cartoons without any cursing and or derogatory words or violence. The cartoon that is on cable now is ridiculous. The cartoon is what I grew up on. Boomerang used to be hands down, the best cartoon station; Worth paying money for. They got rid of their trademark niche of being all great older cartoons, and instead started focusing on new cartoons (which we all know are an absolutely terrible, and uncreative disaster). They play a couple of older cartoons but the majority are newer trash cartoons or terrible recreations of good cartoons from the past. In short, they sold out on what made them great to begin with. DONT WASTE YOUR TIME!! i thot i could watch 4 free but i had to pay. sad. The Boomerang service has been a surprisingly valuable thing for me- middle aged, no children at all in the house even to share it with. Having positive, fun, brightly colored programming from my childhood clear through to today’s, in a variety of lengths from Road Runner shorts to movie lengths, it’s a wholesome and familiar stress buster that fits any time limitations. I particularly like being able to have cartoons such as vintage Scooby Doo with my breakfast. Content is slowly improving on this young service- it’s been a little scant if you are a binge watcher. The addition this month of a huge pile of Scooby Doo series has been fantastic. I’d been slowly purchasing what little of that has been available on iTunes, and even then that runs very steep. One series alone costs $100 to purchase there, so having it on Boomerang is a godsend. Desperately looking forward to watching it on Apple TV soon- so far I’ve only had it on my iPhone. The con to the iPhone app is a bug that needs to be ironed out: it forgets your exact place if you’ve finished an episode and closed the app, so it tries to make you deja vu rewatch it again. It balks if you scan forward to the end of that episode, then forces you to rewatch the end 5 minutes of that episode. There’s no jump to next episode arrow button either. This is a great app. All I want to know is what happened to the super hero cartoons? The hercoloids, space ghost, and many more? Can they be added? I really like this app! However, like most things it’s not perfect.Sometimes when I’m watching my favorite shows the audio will not be working. Usually I’d have to leave the episode and almost immediately resume it to fix the problem. I recommenced that you add KND to the shows to make the app even more popular. Hello, I signed up for boomerang app and right away got a subscription. After I got it it wouldn’t let me play any of the non-free episodes. Every-time I click on a episode it says I still need to sign up but I already did. I’ve tried Restarting my phone and resubscribing and it doesn’t work. Is there anything I can do to fix this problem? You couldn’t spend less than 5$ a month any wiser. The app is nice but I’m not able to pick a show and watch it and it comes up as “video error opps something went wrong please try again” I do try again and again same thing happens. When I’m on my computer it doesn’t say video error. Where’s Chowder, power puff girls (the original), kids next door , grim adventures with billy and Mandy , foster home for imaginary friends, flapjack, dexter . I like that you have Tom and jerry and I love courage. I wish that there were more classic cartoon options and episodes, but besides that it’s great. Anyone that enjoyed watching great classic cartoons this is a MUST have!!! 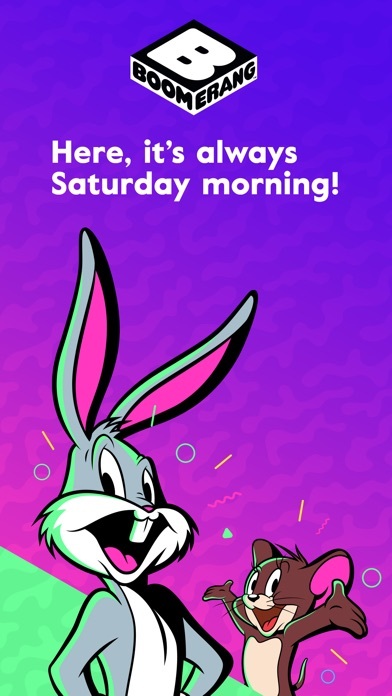 I was born in the 1970’s and there was NOTHING better to a kid back then the Saturday morning cartoons! Scobby Doo, Smurfs, Richie Rich, Flintstones and much much more!! Do not hesitate get this app!!!! Could you please include the Safety Second episode so I can watch it without having to use YouTube. YouTube doesn’t even have the whole episode. Safety Second it is I believe Episode 51 I think idk what Season it is. It please I want to watch it on the app. Which is the reasons why I got the app. Why do we have to PAY!!!! The Cartoon Network logo on the front is very misleading, I downloaded this app to watch Steven universe but instead got a bunch of 90’s cartoons. Just wish shows and movie showed the release dates. I know this shows are old but I want to know how old!! Also I find a pup named scooby doo is one of the only shows that don’t buffer and play blurry. Can you add recess please? The ad said it’s free to watch. What the heck? When I went in I couldn’t watch anything. I’m sorry but please, fix, your, app. 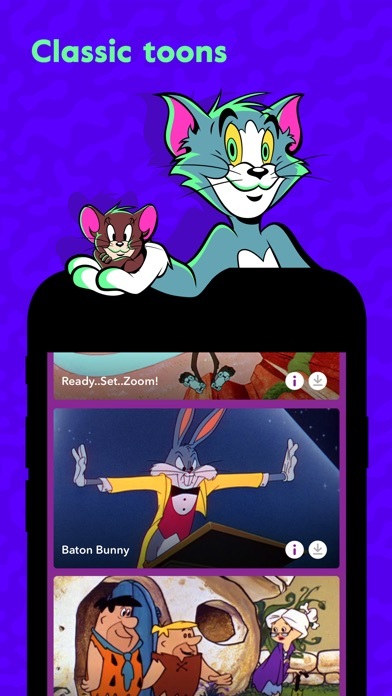 Thanks to Boomerang, I can watch all my favorite shows and movies from Boomerang for free! So, thank you Boomerang! Its pretty funny how the Cartoon Network app was free you could watch any show on there and it would be free. The boomerang app thats a different story you actually have to pay to watch the classic cartoons like Scooby doo pop-eye and so on. It has free episodes yes but the problem with that is its the same free episodes every time they don’t change it up. 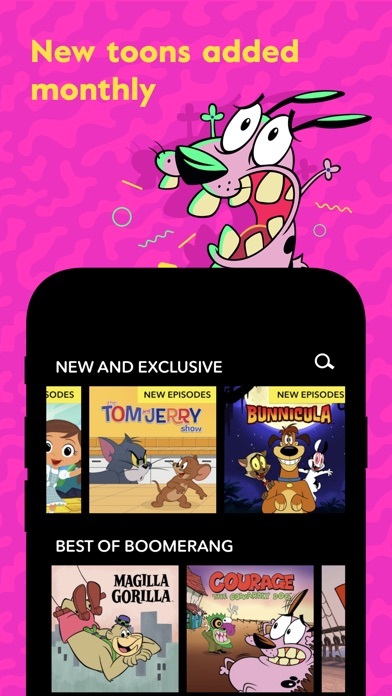 So my main problems were the boomerang app you actually have to pay to watch the classic cartoons and with the Cartoon Network app you get trash cartoons but you can watch them for free and the free episodes in the boomerang app never change. 3/5 stars . Home page opens completely blank. Flip through the tabs and all I see are blank pages. I figured I needed to make an account or something, so I gave that a shot. Nope, no success. An error window comes and you can hardly understand what it says because the person who made it has 3rd grade English skills. So basically I downloaded this App to stare at 4 black screens of nothingness and make an account that just opens a window showing poor English you can’t even understand. Pathetic. If staring at black screens and reading poor English is your thing, this is the App you want. We have to pay for monthly why can’t we watch for free??? Included in TV subscription but no app access? Unlike other networks, it appears you aren't able to simply sign into your provider to access content on the app. You must sign up and pay separately from your TV provider subscription with Boomerang channels. I love the app however, the sound keep going off and no matter what I’ve tried it still doesn’t work. If I’m going to pay for something I expect it to work so can you guys please fix the sound issue, thank you. 1)Payment: I really don’t see why we have to pay to watch shows on an app. 2)Shows: I like some of the shows but the others don’t interest me. I grew up watching shows like Chowder, Foster’s Home For Imaginary Friends, and much more. It would really be a treat to relive the memories of watching shows nobody remembers anymore. But overall, this is a good app. If it didn’t have those two problems, this app would be perfect. I've been trying to watch Scooby Doo for the past two days and it just keeps loading. Even if we're watching something else and I try to switch to Scooby Doo it won't play. Very upsetting. The app is good overall, but it’s a little disappointing that I would have to pay to view the cartoons I love. The app is a good idea, but I don’t use it as much as I would like because of fees. I just downloaded this app and it does not work. It tells me to update right away and when I do it takes me back to the app page where it reads “open” and when I press “open” it reads “update “ once again and I keep going back and forth. I tried to get support but when I clicked to address the issue it reads something like “sorry doc , this only works in the USA” ..I’m in Texas, last time I checked that is the USA. There are three things wrong with this service to justify the cost 1. No favorites listing so you can’t filter down to what you really want to watch, 2. Can’t create personal playlists again to filter a personalized experience, and lastly 3. Apple TV app doesn’t track episode progress so it starts every episode at the beginning. Fix these three problems and I would definitely be a monthly subscriber. I’m keeping this paid month just to get my flintstones, jetsons and scooby fix but I already canceled my subscription so it expires in Feb.
Has anyone ever paid twice in one month for this app? I don’t understand how come at least there isn’t not see next episode or others! Love the app, but I use it through amazon prime service. When I was looking at the app there were more shows to watch and more episodes in those shows. Is it better to have the boomerang app or to go through amazon prime? Do all the episodes just become released at a different time period? Paid for two months separately then paid for the year subscription through my iPhone and still can’t play any videos in the app says I’m not subscribed to anything even though it shows up in the boomerang app and iTunes as me being subscribed!!! Sometimes the video plays with no sound. Please fix ASAP.